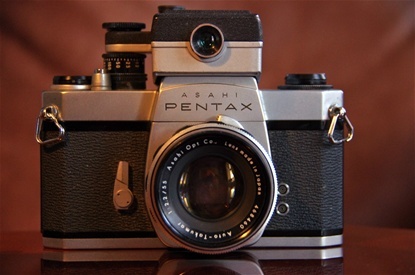 Asahi Pentax Spotmatic was one of the biggest successes in the history of camera production, launched at the annual Photokina show in 1960, produced from 1964 and ending production in 1976 (Spotmatic F). 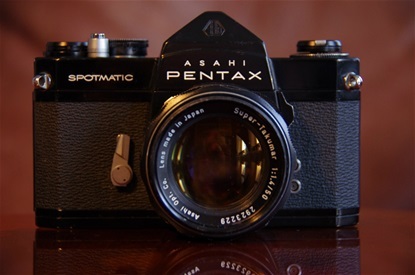 Total production of the Spotmatic family was some 4 million cameras. 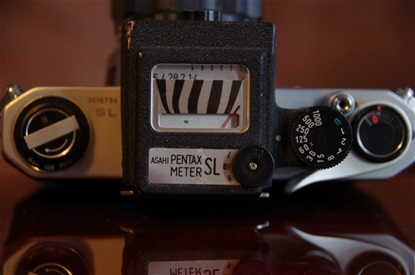 Introducing the Through The Lens- TTL- light metering, the Spotmatic found a solution to the question that all producers had been working on. 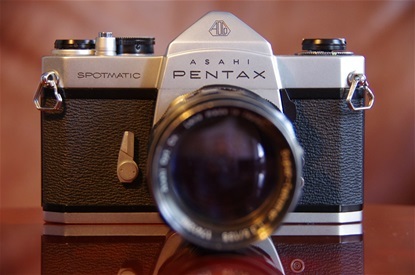 Although Topcon were first on the market, the Spotmatic was what people was waiting for. 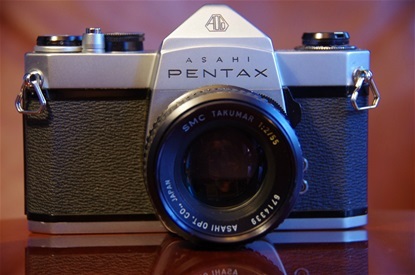 No other model from any other brand had even close to the selling success of Asahi Pentax at the time. Some sources say Pentax sold more than Nikon and Canon together, others say they sold more than all other brands together! Sn. 2569816. Size: 143x92x49. 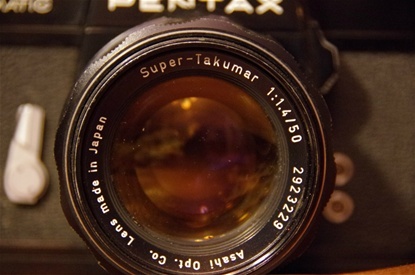 Pentax released a Super-Takumar 50/1,4 in 1965. Usually the 55/1,8 followed the first Spotmatics. The 7 element 1,4 is still considered one othe best normal primes ever made. Mine has sn. 2923229. 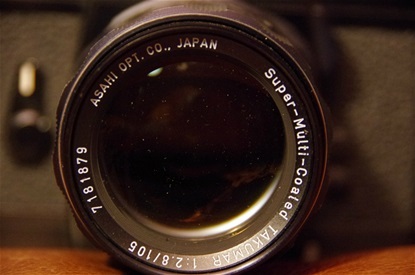 Well known layout: Almost identical to the Asahi Pentax S3. A rubber eye cup fits on the viewer window. 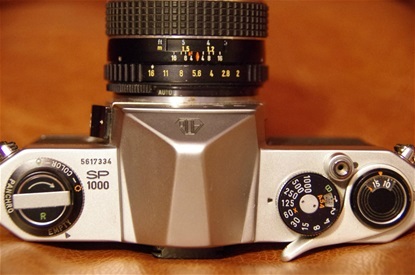 The Spotmatic in silver version. Sn. 3674570. 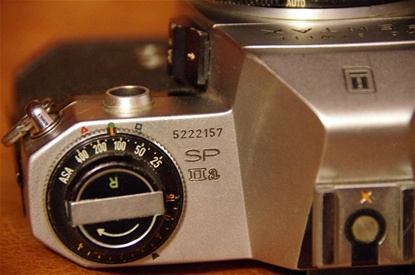 Spotmatic SL came in 1968 as a light edition of the Spotmatic. No internal light meter made it a little lighter, but not with the especially made light meter for the SL. Sn: 3016794. 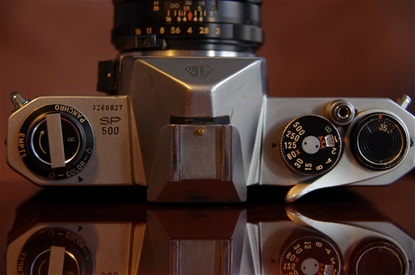 The external light meter was very much like the Light Meter II from 1960, made for the S3. 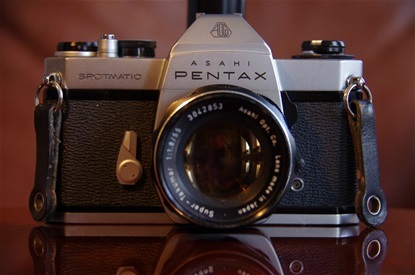 Spotmatic II was presented in 1971. It featured an improved shutter, wider EV and ASA range, brighter viewer, improved self timer and better film tracker by a new roller. Sn: 5016086. Hardly any visible changes from the original other than flash shoe on prism house. 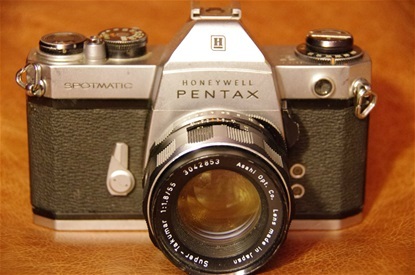 The Spotmatic IIa was produced for the american market only, and therefore in Honeywell edition. 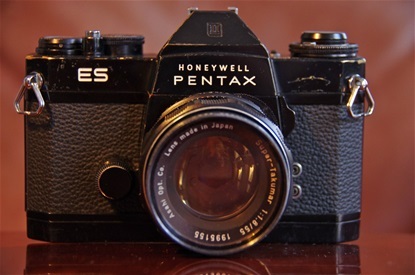 The only difference from the II was the eye in front of the rewinder, necessary for metering the light for the Honeywell Strobolar flash system. Sn: 5222157. SP IIa from 1971. Note the Honeywell logo and the eye at the front. 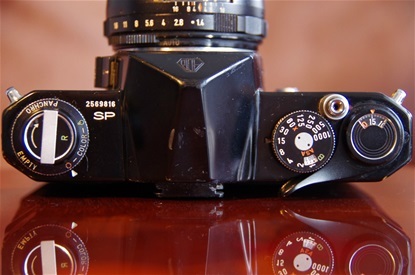 Substituted SL as the economy model of the Spotmatic family from 1971. Sn: 3260827. As usual with the economy models: Fastest shutter time set to 1/500 and a slower lens. Here a Super Takumar 55/2 with s/n 1538445. 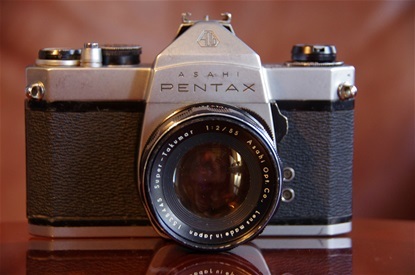 1971 and time for another worlds first from Pentax: Automatic shutter when choosing aperture. 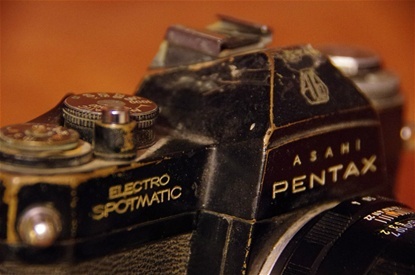 The first series were called Electro Spotmatic and was only sold in Japan. Sn: 5537890. 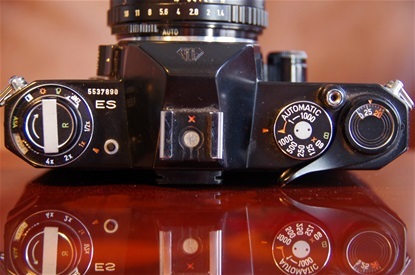 Choose between manual or automatic shutter mode. Speeds from 1/1000 to 1/60, longer times through automatic mode. Button for battery check to the left of prism house. A well used (or misused) sample. Winder and shutter still kind of working. Sn: 5530356. Still 1971 and now open for the world under the name ES. A few improvements electronically from the first version. Here a Honeywell edition for the american market. Sn: 6539622. 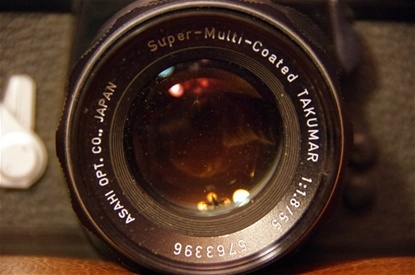 The Takumar Super-Multi-Coated lenses were introduced with the Spotmatic II and ES cameras in 1971. Here is a 105/2,8 sn. 7181879. 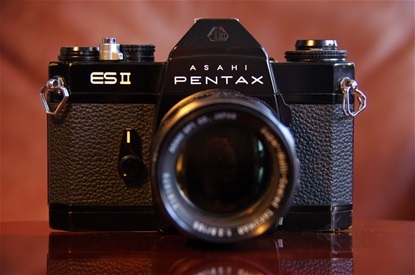 The ES II was introduced in 1973 with some further improvements on the electronics as compared to the former edition. Also note the silver shutter button with on/off position. Sn: 6704896. 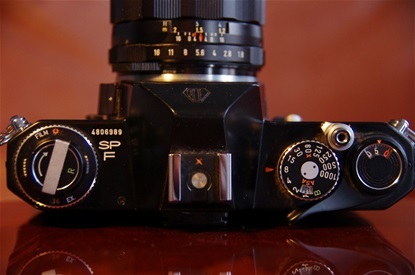 The final high end Spotmatic: the F from 1973. Metering at full opening, among the improvements. 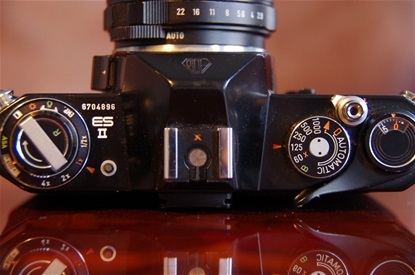 Also on/off position on shutter button. Sn: 4806989. Same pattern as on previous Spotmatics. 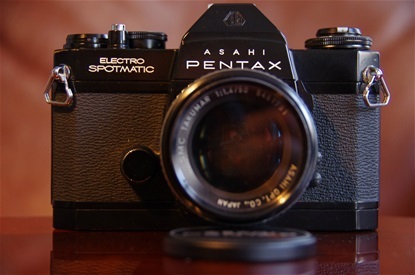 The last Spotmatic. 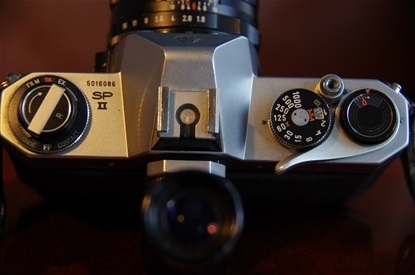 Followed the SP 500 as the low budget Spotmatic from 1973. Sn: 5617334. 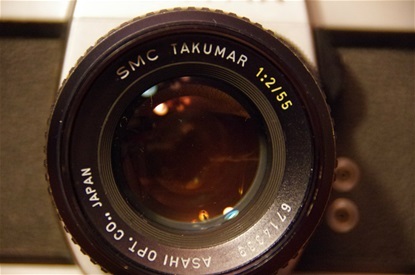 With the correct lens, a Takumar SMC 55/2. Sn: 6714339. 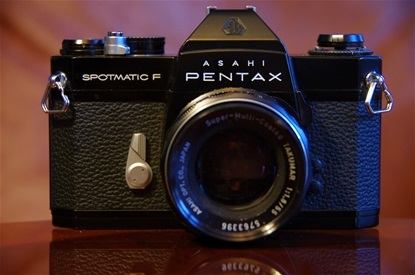 Sp 1000, the last Spotmatic. Terrific camera. Got mine cleaned and adjusted now it's like new.